Retired NYPD officer Ken Eurell says the first time he stole money on the job, he was responding to a burglary call. When he got back in the squad car, he says his partner Michael Dowd pulled out a wad of cash he&apos;d taken from the scene and handed over a $100 bill. Eurell took it, though he doesn&apos;t remember how he spent it. "I bought bad karma with it," he told me. A new documentary, The Seven Five, tells the story of Eurell and Dowd, two corrupt cops working out of the 75th precinct in East New York, Brooklyn, during the height of the 1980s crack epidemic. For Eurell, stealing was just the start. Taking cash from homes led to taking cash from drug dealers in exchange for tips about police drug investigations. 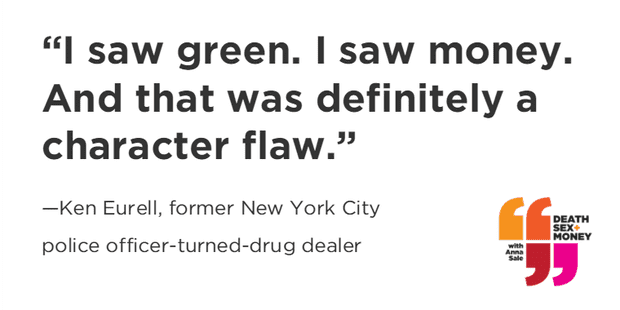 "From my perspective, it was pure greed," Eurell recalled. "Once it was drilled into my head and my brain was rewired to do my job in a search for padding my paycheck, that’s all I saw." When Eurell retired from the force at age 28 on disability, he started dealing drugs himself, lacing pure cocaine with chemical fillers to boost his profits. The police finally arrested Eurell in 1992, and he decided to cooperate with the cops on a plan to bust Dowd, his former partner. Dowd was arrested; Eurell moved to Florida with his wife and kids. He’s been there since, where his NYPD pension and the money he’s made selling auto parts help cover the bills. I had plenty of questions for Eurell about his story—how he came to do what he did, what his wife thought of all this extra cash coming in, and whether he feels any remorse now that it’s all over. The documentary The Seven Five is in select theaters this summer and available for streaming on iTunes, Amazon and Google Play. Tell us about your favorite documentary! Add your suggestion to our Google spreadsheet, and get inspired for your next movie night.